When designing your office layout, it’s not just a matter of dumping desks and chairs where they fit and hoping that your employees will make the best of it. There is a lot more thought that needs to go into it than that. At first it might feel overwhelming, but if you take it calmly section by section and if you take notes of what needs to be done, it should be a lot easier – plus it will make your workforce (and yourself) much more productive when they can work in an office that looks and feels just right. 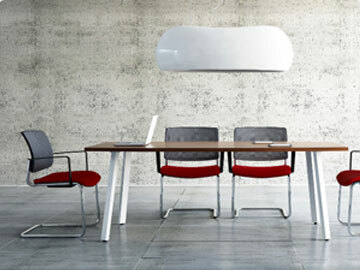 First things first, office furniture should be the epicenter when thinking of a redesigning or moving into a new office. Buying cheaper furniture might look good to your accountant and bank account, but the old saying that goes ‘buy cheap, buy twice’ will always hold true. If you pay a little (or a lot) more for better quality office furniture it will last a lot longer and you won’t have to pay out for more like you would if you bought cheaper stuff in the first place. Another reason for paying more for better furniture is that it is more likely to be ergonomically designed (look out for this when you make your buying choices). This will keep your employees more comfortable and stop them from developing any injuries, such as bad backs and necks, from using the wrong kinds of furniture and equipment for too long. Having as much natural light in your office as possible is a great idea and should definitely be something you look into when you’re trying to organise where your office equipment is going to go. Natural light will enable your workforce to see better and it’s much better for the health of the eye than fluorescent lighting is, for example. In fact, working under fluorescent lights can cause headaches and eyestrain as well as a feeling of claustrophobia in some people. This isn’t the only reason to ensure you can have as much natural light as possible in your office space. Another is that it improves productivity levels. Melatonin is a hormone that makes us feel awake and alert – being exposed to natural light boosts the melatonin in the body and therefore increases productivity. Offices with large windows are a great start, but in order to make the most of the sunlight available, open plan offices work well. If you do need to have certain areas shut off from others then invest in glass walls and not boarded ones; you can always install blinds for privacy if and when it is needed. Choosing an office because it is in the right location is fine if it is also going to be big enough for your needs. If it is too small, your employees may find it uncomfortable and it will look cramped. It will also not be a place you want to bring people in for meetings. It makes a lot more sense to find an office that works best in terms of space and let location be a secondary consideration. Your employees will be far happier to have a comfortable, spacious place to work and may not mind having to take a couple of extra stops on the subway or bus. Even if you don’t have the budget to get the size of office you’d truly like, making sure that you place your furniture thoughtfully can give the impression of more space than you really have. Having a clean and tidy office is paramount – no one can be properly productive in a big old mess. That means regularly cleaning the place (or having cleaners come in to do it for you) and ensuring that everyone keeps their own personal space as clean and tidy as they can. To help them with this task, give them bins by their desks and check that the desks you are ordering have got drawers in them. This will help your staff immensely. By the same token, what is the storage like in your office? Is there enough of it? It’s good to have space to keep those items that aren’t needed all the time (such as cleaning equipment, spare chairs, Christmas decorations, and anything else they might be put away), otherwise they will end up being in the way of everyone trying to work. This is both unsafe and will cause clutter which leads to lower productivity among employees.